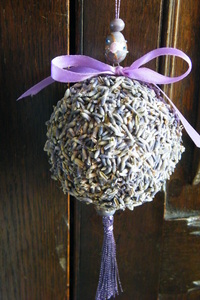 This pomander is very decorative and easy to make. Use it to perfume your wardrobe – keeping your clothes smelling fresh and deterring clothes moths! This one is hanging on my wardrobe door as I thought it was too pretty to hide away. It’s cheap to make too – the polystyrene ball was 29p from a craft shop, and I used beads and ribbon left over from other projects. Carefully poke a hole all the way through the middle of the ball using the skewer. I found it easier to do this first and leave it in place as it gives you something to hold while gluing on the lavender. I covered the entire ball with PVA and pressed the lavender into it. Once it had dried, I checked it over, removing any tiny stems and patching holes. I ended up with a covering about 0.5cm thick all over. Because such a small quantity of lavender wouldn’t smell very strong, I sprayed the ball evenly all over with lavender essential oil and allowed to dry. I then removed the skewer from the ball and inserted a short piece of florists wire all the way through. It was just long enough to allow me to form a loop top and bottom to attach the tassel and hanging loop. At the bottom, the tassel is wired in place through a large bead which stops the whole thing pulling upwards. At the top, the hanging loop is tied onto the wire loop with a couple of beads for decoration. The ribbon bow hides the wire. To spray the ball, I emptied a 10ml bottle of lavender essential oil into a small spray bottle obtained from my local chemist. If using oil, keep away from polished, painted and synthetic surfaces & textiles in case of marks. Adding oil means that you aren’t reliant on the natural fragrance of the lavender, so you can choose a less fragrant but deeper blue dried lavender if you wish. The pomander can be refreshed from time to time with another drop or two (or spritz) of oil. I like to use hi-tack PVA glue because it holds items in place while it is drying. Would you give me your permission? Thank you very much! Greetings from Argentina! Thanks very much for commenting! You are welcome to use this post, however you must provide a full credit and a link back to this page. I’m planning on making these for mother’s day with my grade 3 class. Do you have any idea of how much lavender you used for 1 ball?